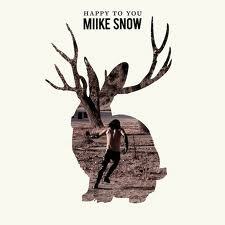 Happy to You starts out in formidable Miike Snow fashion with a relaxing and engaging sound. “Enter the Joker’s Layer” captures you from the start with the groups ability to blend digitally appealing sounds around the harmonious voice of frontman Andrew Wyatt. “The Wave” comes in with a cavalry sounding drumline fit for a king. It is a song that focuses on the overall sound with a strong but softening drumline. This theme is carried out through the entirety of the album. Miike Snow made us wait 3 long years for their sophomore album but I am not surprised by the quality of work that was produced. Now, if I could only pick their complex Swedish minds to interpret what message they are trying to send to all of us with Happy to You. This album is whatever it represents to most importantly; you. “Devil’s Work” explains that you do not have to sell your soul to do the Devil’s work. This statement makes a lot of sense to people who have good souls since they know when one is doing wrong. Even if, they are not directly working for the Devil or have sold their soul to the Devil. The way they bring the horns in at the end of the track makes for a strong close to an even stronger song. “Vase”, the fourth track, lightens the mood again after all the darkness surrounding the dark prince himself. The chorus of the track gives you a feeling that you are whistling while you work. I really do not know how anyone could be in a bad mood while listening to Miike Snow. Just after I get done saying that I do not know how anyone could be in a bad mood while listening to Miike Snow, they come back with the track “God Help This Divorce”. It chimes in with a somberness that somehow still makes me feel good about feeling bad. They just make music that should make you feel bad even make you feel good. An art they have been perfecting since their self-titled debut. “Bavarian #1 (Say You Will)” has been my favorite track since my very first listen of Happy to You. The cavalry sounding drumline of the marching band is back and the song just has that feeling that gives you pure jubilation. The track slightly reminds me of myself and having the hope of having certain people in my life say that they will do certain things for me or to me. It is a clever song that gives me false hope as I sing along. The powerful third single, off of Happy to You,ends on the same drumline that gets it started; perfection at its finest. “Pretender” is a song that a lot of people in the Midwest, especially Wisconsin could resonate with. For the reason that they talk about not wanting to wake up because they drink too much. A statement all too familiar for someone who lives in La Crosse, WI. The next track, “Archipelago”, slows it up a bit at the start only to gradually build and pick up steam with the keyboard acting as the locomotive. This song along with “Vase” remind me a lot of the American group Vampire Weekend. “Black Tin Box” is the slowest song on the new album. It is a little darker than the rest of the tracks but surprisingly you are ready for something like this after all the happiness the album has produced to this point. They finish off the album with the first single released off of Happy to You, “Paddling Out“. This song gives you an upbeat 80’s dance feel and is a great way to contrast the slower “Black Tin Box”. It is a track that will get people dancing and would be a phenomenal way to close out their live shows and the likes this album, as well. Happy to You is an album that I love from front to back. The way they use clever drumlines, people whistling and the different pitches of Andrew Wyatt’s voice to mesh with the music makes this album perfect imperfection that you can experience over and over again. Miike Snow manufactured their product of happy and distributed it to you. This entry was posted on Thursday, June 21, 2012 at 9:41 am and is filed under Album Review, Music Reviews, Reviews with tags album review, Andrew Wyatt, Archipelago, Bavarian #1(Say You Will), Black Tin Box, Devil's Work, Enter the Joker's Layer, God Help This Divorce, Happy to You, March 13 2012, Miike Snow, Paddling Out, Pretender, The Wave, Vase. You can follow any responses to this entry through the RSS 2.0 feed. You can leave a response, or trackback from your own site.